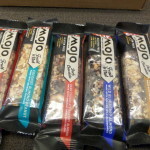 Luvo love for exciting new choices! 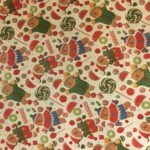 Home » The Blog » Giveaway! 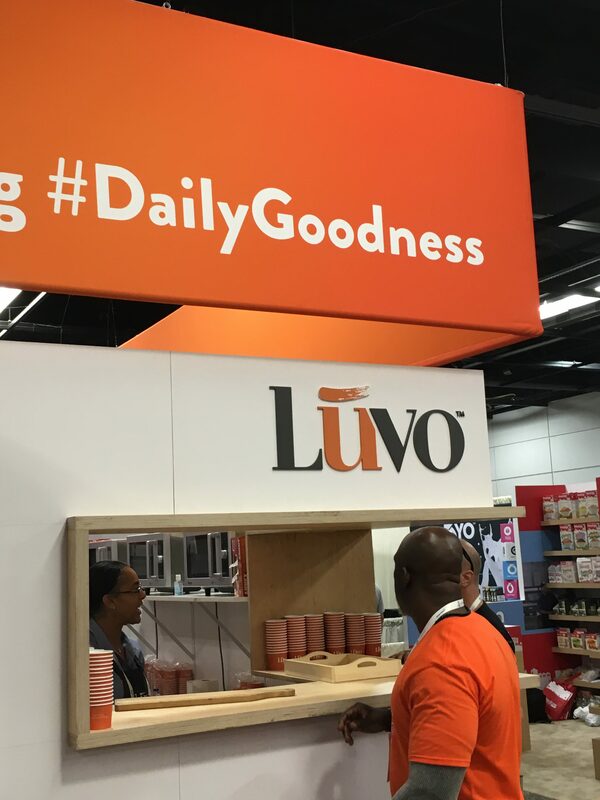 » Luvo love for exciting new choices! 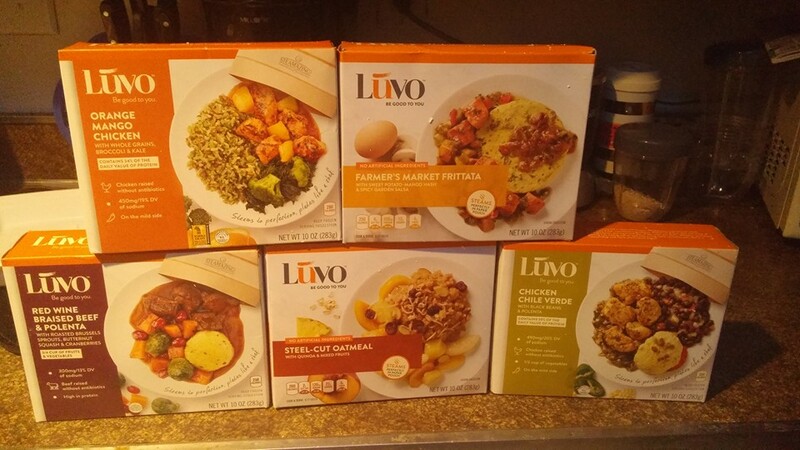 Disclosure: Earlier this year, I received complimentary Luvo entrees because I am a BibRave Pro. 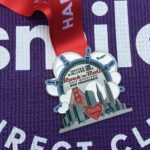 (Learn more about becoming a BibRave Pro, and check out BibRave.com to review find and write race reviews. 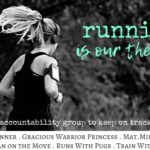 It’s a great way to help race directors see what is working and what needs improvement, and to help other runners find out what a race is really like.) 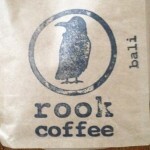 You can read my original review HERE. Please note that while Luvo generously provided the free entree coupons for the giveaway, Luvo had exactly zero input on the content or timing of this post. All opinions are my own. 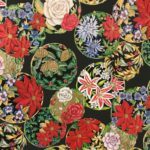 I've been a Luvo fan since I first tried their steam-in-the-bag entrees in February, so I've been gently stalking them since them to see what might happen next. If you saw my review (hint: go read it now) you might remember I ended on a hopeful note, looking forward to more vegetarian entree options. Later in March I was lucky enough to chat with the team behind Luvo at Natural Products Expo West in Anaheim, the premier trade show for everything in the natural foods, body products, lifestyle, and ingredients space. 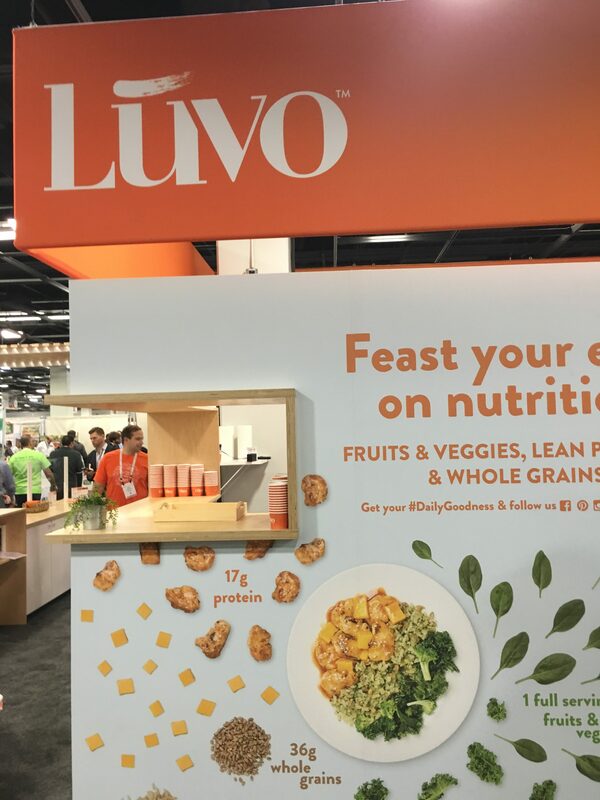 Luvo had a brightly colored, multi-space booth featuring a see-inside kitchen and orange-clad waiters passing samples on trays. You'd better believe I accepted every vegetarian option I was offered! It was cool to get to chat with some of the faces behind the meals. 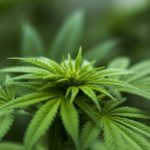 Since then, a new round of BibRave Pro team members have tried Luvo. Jeremy over at Confessions of an Amateur Athlete liked that they don't come in wasteful plastic trays, but instead in small steam pouches. 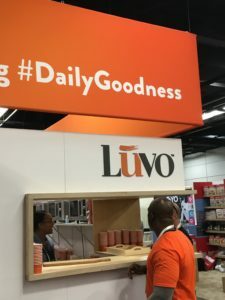 He also liked that Luvo takes pride in NOT adding a ton of sugar (and having just read Salt, Sugar, Fat I now know what a big deal that is–the vast majority of packaged foods have added salt and sugar to enhance or disguise their flavors). SlackerRunner had some issues remembering how to work the microwave–not an issue I face, sadly–but liked the taste of the no-soy, no-dairy, no-nuts, no-fish entrees she tried. 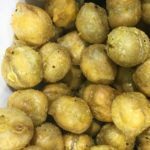 Arizona Sun Goddess, on the other hand, called the new flavors she tried, “steamazing.” Melinda over at 30 Something Therapy liked some of the ones she tried better than others, and she's on a gluten-free diet from what I've read. 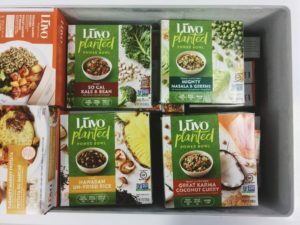 Carolyn from Run Fierce, Live Fit was initially skeptical about prepared frozen foods (she doesn't eat much processed food), but Luvo won her over. COMING SOON! New vegan, gluten-free options from Luvo! Okay, busted, I'm also gently stalking Luvo on social media. (Got a brand you love? I highly recommend this strategy for getting the scoop first.) I cannot wait to hunt these four–and their comrades–down and put them in my belly. Seriously, my schedule always has me on the hunt for healthier choices like Luvo, since I rarely have time to cook a whole meal for myself. Just as an example, I was only home for 30 hours for about 21 days of October. 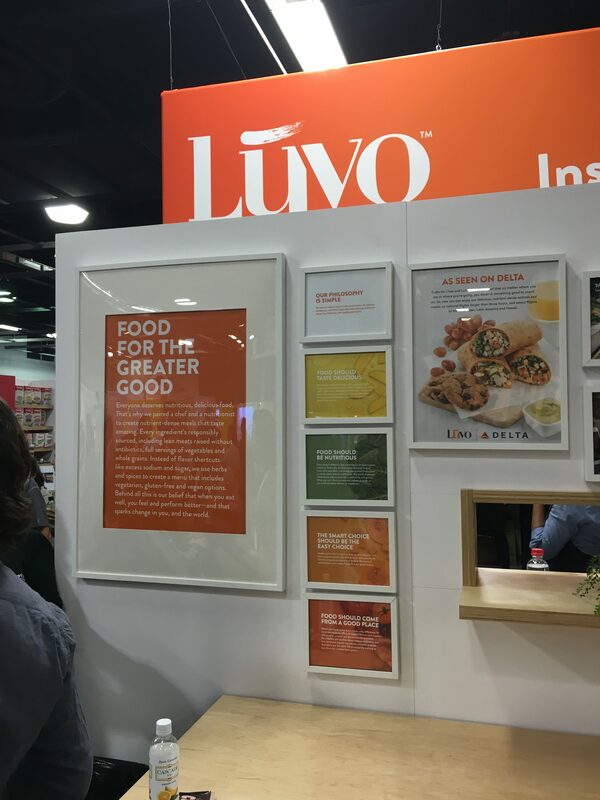 Luvo's Expo West booth displayed the goodness inside on the outside! Want to try out Luvo for yourself? 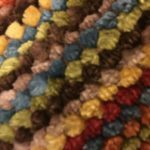 I have FIVE free entree coupons for you! These are manufacturer coupons that expire February 28, 2017 and it will be up to you to find your nearest Luvo dealer, I mean retailer, and redeem them before they expire. 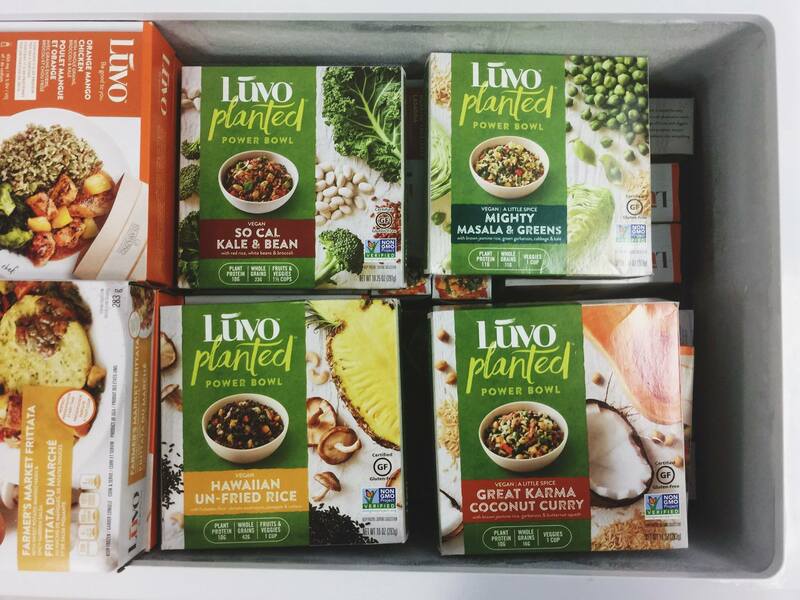 (Hint: check out Luvo's “where to find” page to see if there is a grocery near you.) 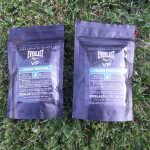 If you win, I will pop them in the mail to you when the giveaway ends. ← City to the Sea: Happy Birthday to Me!